This is a house we have designed the first time in 7 years. The site is situated ten-odd minutes away from the city center and is closed to a huge river. Originally it was an area where farmland and factories existed all over. However the area has developed rapidly into housing land in recent years, and numerous small-scale developments are conducted without any coordination. 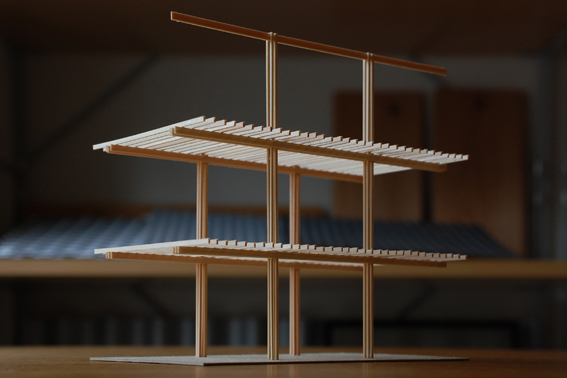 As a result, a miniature version of a suburban single-family house are build in the surroundings, creating a typical scenery of a contemporary city, which is neither the city center nor the suburb. The site is a size that a garden could not be made after the space for the architecture and parking is secured. In order to have the largest floor plan possible under building regulations, the shape was automatically decided as a simple rectangular three storey high building. 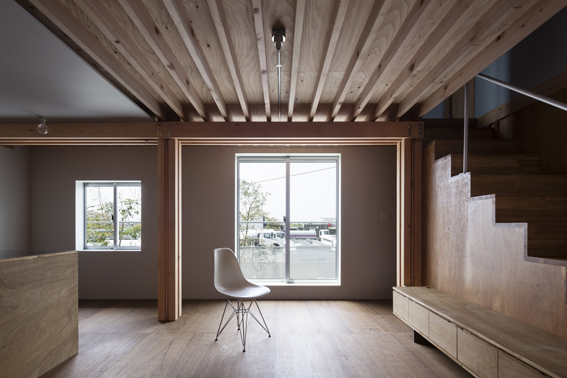 From the construction cost, the structure was decided as timber. High quality resistance of fire and earthquake is required for a three storey high house in the city. 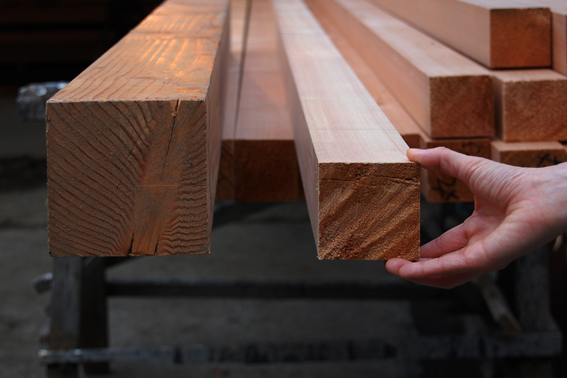 For this reason, when building with timber, we need to take extra measures such as fireproof coating or fire resistance design. 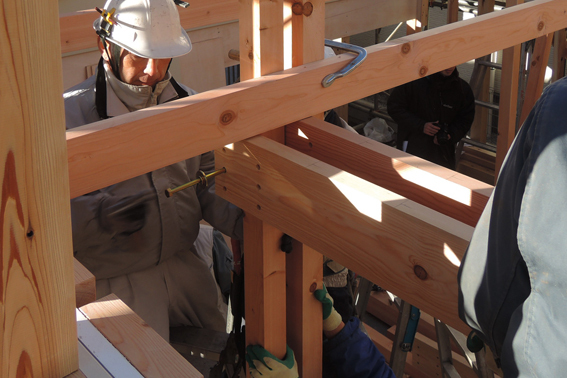 However, for this building, we used the newest public notification (No.861) that allows the exterior wall to be fireproof construction even for timber structure buildings. Through ensuring the fire and earthquake resistance by the exterior wall, we managed to have a rich interior space. 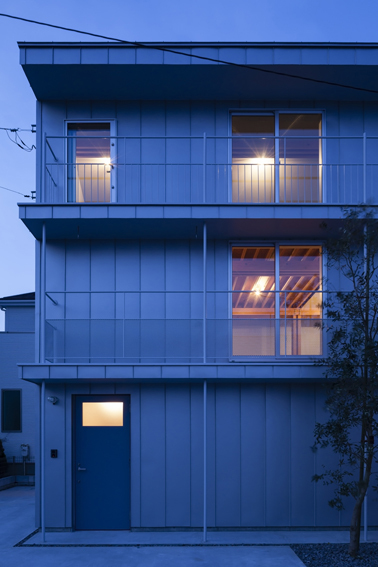 The exterior wall of this house inevitably becomes thick with little openings like a Kura　(Traditional Japanese house storage). We could say that this is the shape of the specification required for living in a contemporary city. In the early modern period of Japan, areas throughout the country were seen, where people lived in kuras called “Dwelling Kura”, making use of it’s high tolerance of fire and earthquakes. The townscape of Kawagoe and the Kashiwakura Family’s Kurazashiki in Yamagata are the excellent examples that remain in our times. The chunky form gives a unique presence in it’s surrounding and a beautiful tense space is wrapped inside, where the inner and outer space is connected through a small yet beautiful light. This is where we can find the new possibility of the contemporary dwelling space. This is a proposal for a “Kura-type” dwelling space in a profligate city of our times, which is a contrast to the huge openings or half outdoor spaces of Minka (Japanese folk houses) or Machiya (Japanese townhouses). What is required for a Kura-type dwelling space then? Flexibility and generosity are required in any times in order to create rich daily lives. If so, what has been lost from the dwelling spaces of our contemporary times? That is the tense atmosphere of space resulting from formality. Since Shoin-zukuri (traditional style of Japanese houses) of the early modern times, Japanese dwelling spaces lack formality. 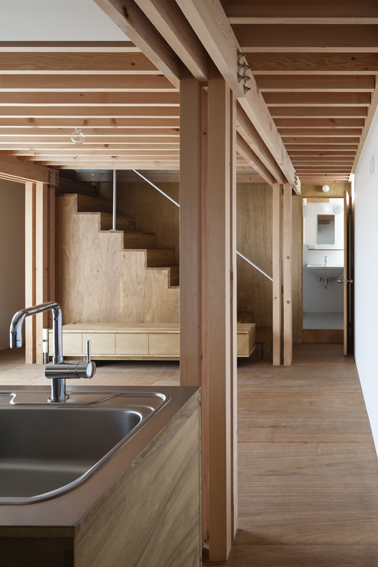 Sukiya (traditional style of Japanese architecture originating from tea-ceremony rooms) is an accumulation of personal sensibility and the post-war nLDK (typical Japanese contemporary hosue style constituted by number of bedrooms plus a living-dining room and kitchen) doesn’t aim for space. 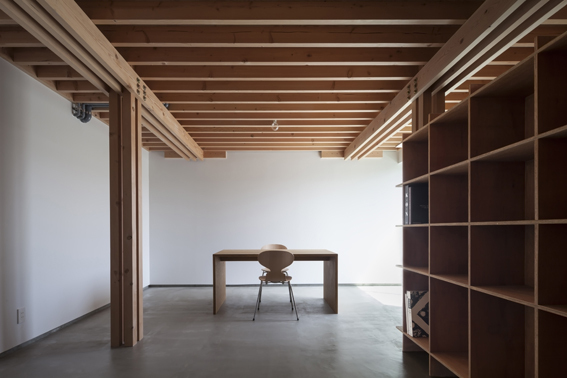 In order to achieve a generous but tense space, “Yotsudate”, which is an old structural frame typical to Koshu-region became our image source. 4 columns assembled like scaffolding, constitute the structural frame and it is said to be the transitional form of the Japanese dwelling space from a pit dwelling to a medieval period dwelling. 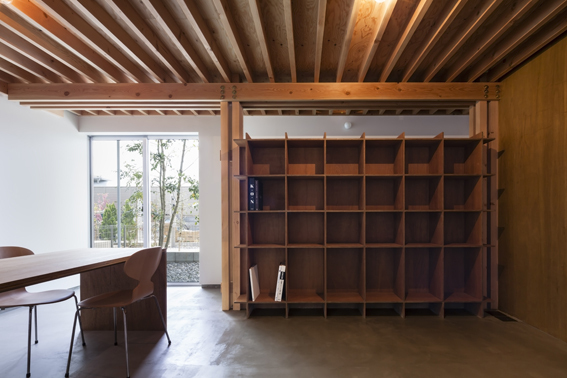 While it is a symbolic structure holding up the roof, it also becomes the clue for daily life through movable partition walls and the placement of the furniture. The floor plan of this house is simply organized by a 2,730mm square with 4 columns in the corner, placed in the center of the plan. From the formality created by the square column space, a tense atmosphere like an Amida-temple (type of Buddhist temple) is produced. 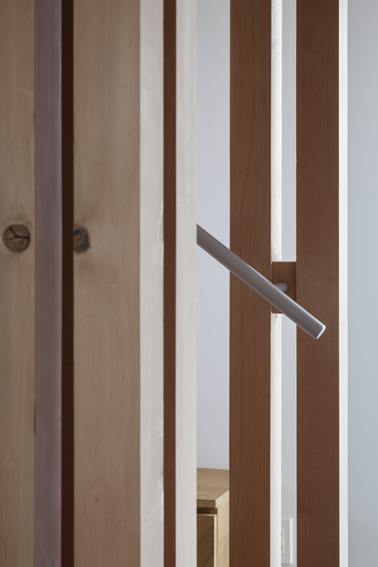 The column is constituted by four 75mm square timber bundled together. 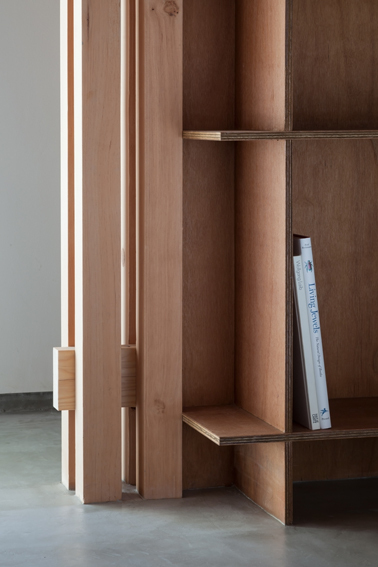 A gap is created in between the bundled timber where moveable partition walls or furniture could be attached that allows it to become adaptable to the change of various usages. In this way, the structural frame starts to dissolve from a symbol to daily life. 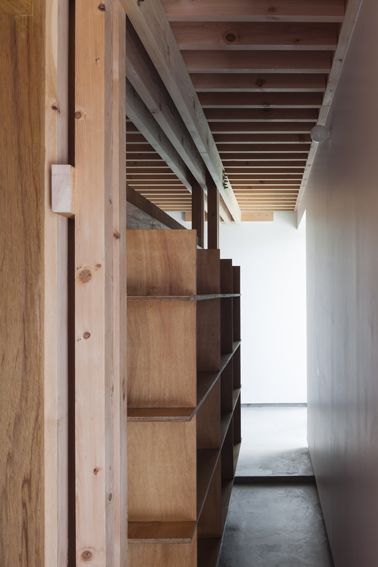 Of course it also takes on a functional role, where it lowers the height of the beam and the joist allowing each floor to have a larger volume. The connection points of the vertical elements and the horizontal elements are all joined by bolts and screws allowing the house to have a feeling that it is still being assembled even though it is finished. Because of the simple organization of this house, we repeated close investigation of the distance between the columns and the dimensions of each element, which are much smaller than the ordinary ones. The point of balance between practicality of not elaborately finishing too much and the neatness of not being too rough was carefully decided with the client and the contractor at the construction site. At the roots of our architecture, we have a curiosity towards history and craft. We closely examine what we can use from them and overhaul them, in order to reuse them in our times. This is a simple and a natural thing to do. Hence, the handling of it matters. For this house, the most essential thing was up to what extent could we abstract the formality created by the square space defined by the columns without destroying it. The disconnection of space of an urban architecture is its destiny, since its multi-storey feature will divide the space by its floor. Since Corbusier, multi-layerizing the space by creating openings in the floor was the only solution. 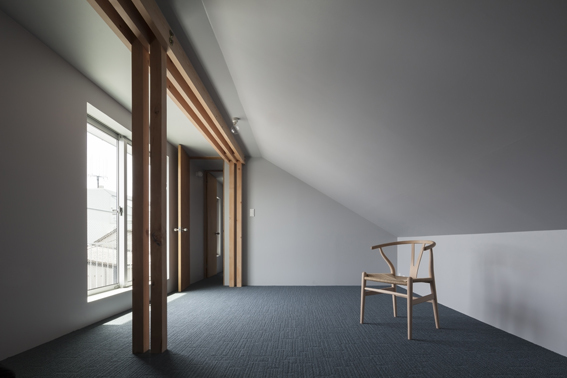 However for this house, we tried to achieve the totality of space though formality. We would like to create the interesting universal features of formality, history and craft into architecture. We would be heading towards the future while looking back in history as if rowing a boat forward while looking backwards.